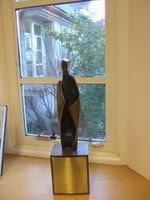 Entries are invited to our annual Senior Poetry Prize, in memory of Old Columban Peter Dix (above, the sculpture by Joe Sloan which is displayed in the Library). This year the themes are Freedom and/or Friendship and/or Family. Entries should contain a portfolio of two to five poems of 40 lines at most, and at least 10 lines. The winning entry will be chosen on the overall standard of the entrant's collection. As usual, the best entries will be posted here. Poems are to be emailed to Mr Canning by Friday 24th May.